(Nanowerk News) Invisibility cloaking was almost inconceivable until the ingenious theory of macroscopic invisibility cloaking was proposed based on transformation optics principles. Because of the tremendous difficulty in practical realization, various approximations were generally taken to simplify the complexity of a perfect cloak. For example, nonmagnetic optical cloaking was proposed by embedding metal nanowires in a dielectric material. With these approximations, cloaks that could hide objects roughly one wavelength large – an optical wavelength amounts to the scale of single-celled organism – have been experimentally demonstrated in both microwave and optical spectrum (see for instance: "Nanotechnology optical cloaking design for invisibility"). Now, though, researchers have demonstrated in experiment that by abandoning the phase preservation requirement it is possible to create invisibility cloaking for natural light in multiple observation angles. Such a cloak will act as a cloaking device operational on the ray optics approximation. It will disregard the fine effects of interference seen in wave optics but will offer good performance for hiding macroscopic objects much larger than the wavelength of light. The work, led by Baile Zhang an assistant professor in the School of Physical & Mathematical Sciences at Nanyang Technological University in Singapore and Hongshen Chen, a professor in the Electromagnetics Academy at Zhejiang University in Hangzhou, Zhejiang, China, is available online in a manuscript on arXiv ("Natural Light Cloaking for Aquatic and Terrestrial Creatures"). Two videos shot by the team document real life cloaking performance using a fish tank and a cat as an example. Experimental observation of fish in aquatic ray cloak. a, Experimental setup in a fish tank. The cloak is constructed with six pieces of glass with n = 1.78 (indicated in dark blue) enclosed in a hollow hexagonal container. b-e, Dynamic monitoring of a fish swimming through the aquatic ray cloak. The outline of the invisible fish body is indicated by dotted lines. b, The main fish body inside the cloak is invisible but only the tail outside of the cloak is visible. c, Only the fish head outside of the cloak is visible. d, The main body of the fish comes out of the cloak and thus becomes visible. e, The whole fish has come out from the cloak. Now the scientists proceeded to extend the simplified cloak from the aquatic environment to a terrestrial one with air as ambient medium. To demonstrate the capability of this cloaking strategy in hiding creatures especially in a dynamic background in natural light illumination, they use an office projector equipped with an incandescent bulb to project a dynamic field scenery through the cloak. The light emitted from the incandescent bulb has very similar characteristics to natural light in terms of random polarization, incoherence, and continuous visible spectrum. A screen behind the cloak is used to display the projected image. Experimental observation of cat in terrestrial ray cloak. a, Experimental setup to test the cloaking performance. The cloak in dark blue is constructed with glass (n = 1.78) and has dimensions of 0.3 m long (along the y direction), 0.26 m wide (along the x direction), and 0.07 m high (along the z direction). An office projector projects a movie through the cloak onto the screen behind the cloak. A camera (not shown here) placed behind the screen records the movie on the screen. A live cat is sitting inside the cloak. 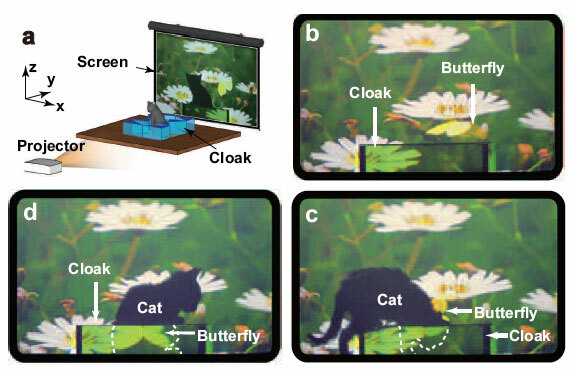 b-d,The images displayed on the screen when (b) only the cloak is present, (c) a live cat is stepping into the cloak, and (d) the cat?s main body has settled inside the cloak, respectively. The outline of the invisible body of the cat is indicated by dotted lines. During the whole process, the butterfly in the background scenery is flitting about. The cloak isn?t ready for prime time yet. In both environments ? terrestrial and aquatic ? the device itself is still partially visible, owing to the shadows it casts on the projected background. 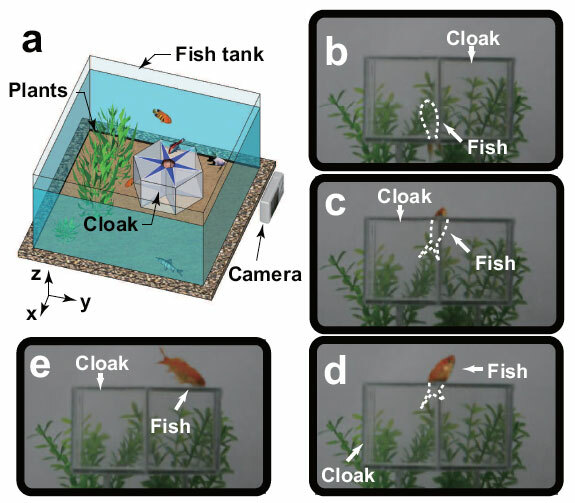 Although the demonstrated cloaking solution is only effective for several observation directions, this work has successfully made a step toward practical application of invisibility cloaking in hiding large-scale creatures in plain sight. By reconfiguring the prisms the cloak operators could make them disappear from the sight along any given direction which lands to important security, entertainment, and surveillance applications.